go2zone is an initiative by Healthy Land and Water to provide free, chilled Australian water to the community and cut down on single-use plastic bottle waste. go2zone water refill stations can be found throughout South East Queensland and present a sustainable alternative to the 9 billion single-use plastic bottles consumed by Australians every year. Healthy Land and Water is dedicated to the care of our unique and beautiful land, waterways and biodiversity and we believe go2zone is one of the essential ways to protect the future of our waterways. 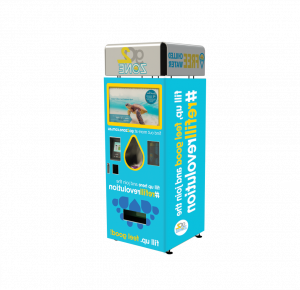 Dispense FREE, chilled, clean, Australian water to refill bottles. Dispense premium quality, reusable glass or stainless steel, socially responsible water bottles at a value for money price. The stations and bottles are a result of rigorous research. On average, 1 litre of water costs more than 1 litre of petrol. The cost of producing water is also costly. The plastic is derived from crude oil, fossil fuel is required for transportation and it takes approximately 3 litres of water to make just 1 litre of bottled water. Although they can be recycled, many plastic bottles are used once then discarded, and often end up in our waterways where they can kill killing marine life that mistake plastic for food – 30% of turtles found dead in Moreton Bay had ingested plastic. Scarily, plastic that ends up in landfill takes up to 1000 years to break down. So do your bit, embrace the refill revolution and help protect South East Queensland’s environment!